DESCRIPTION Price Adjusted. Breathtaking Mountain & River valley VIEWS from the main & 2nd floor of this "Baywest" custom, upgraded "like new" RIDGE home. Excellent plan. MAIN FLOOR: Large Foyer, Den, Great room, views from the Living room (with gas fireplace), spacious Dining area (with windows on 3 walls) & Gourmet Kitchen with large island. There is access from the dining area to the screened covered deck. A walk-through Pantry, spacious Laundry room with large sink & lots of storage, 2 piece bath, large Mud room with direct access to garage & side yard (with dog run) complete the main floor. 2nd FLOOR: Enjoy the VIEW from the large Bonus room with access to the upper balcony. The spacious master suite features a 5 pce ensuite with a huge walk-in closet, many built-ins & make-up desk. 2 more bedrooms & a full bath complete the 2nd floor. BASEMENT: 4 piece bath, large Recreation/rumpus room, furnace/storage area & potential for a 4th Bedroom. This is a very special property. Please see additional Public Remarks. Granite & Quartz counter tops, top of the line stainless steel appliances, Hunter Douglas blinds, 75 gallon H20 Tank. My Q garage door opener system (not installed). Low maintenance professionally landscaped yard complete with raised flower beds, mature trees & shrubs and top of the line artificial turf with a putting green in west back garden. 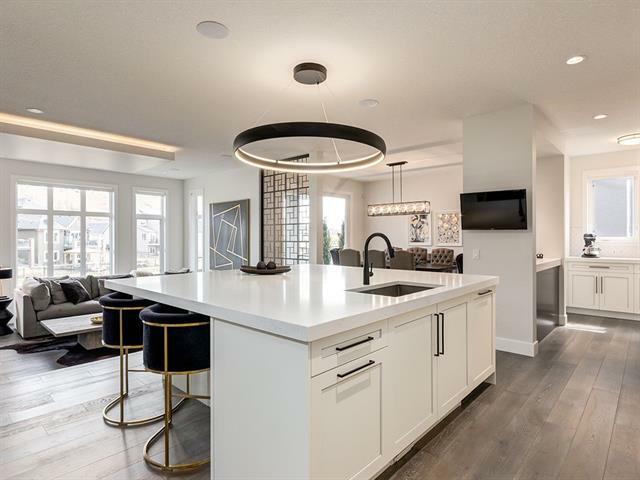 35 Cranarch Ri Se, Calgary, Alberta, MLS® C4225125 T3M 1M3 is a Detached, 3 bedrooms, 4 bathrooms, approximately 2,845 Sq. Ft. Listing price 974,000.00. This property was built in 2012.